The traditional steering option on zero turn lawn mowers, including mid-grade ZTRs, is a lap bar. With these rear-wheel-drive mowers, you push one side of the bar to point your mower in one direction and push the other side to drive in the opposite direction. The lap bar mechanism can take some time to get used to, but the rear wheel drive (and low weight in the front of the mower) help give lap bar ZTRs excellent maneuverability. For those who aren't comfortable driving zero-turn mowers with lap bars, there is a steering wheel option. Unlike the caster wheels on lap bar ZTRs, which move independently, the front wheels on these models are controlled by the steering wheel. 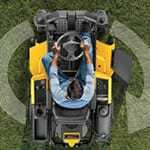 No matter which steering option you choose, you'll still get the ability to turn on a dime that zero-turn mowers are known for. To get the most from your mid-grade mower, look for models with a 3-in-1 cutting option. This allows you to switch from discharging your clippings through a side chute to mulching or even bagging your debris. Other models feature side discharge only. 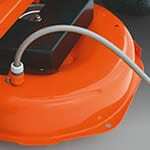 Although some mowers are built with stamped metal decks, the standard on zero turn mowers is a 10-gauge welded steel deck. This material is thicker and strong than stamped metal. Additionally, some zero turns come with mechanical foot lifts for raising and lowering the mowing deck. Finally, look for washout ports for easy deck cleaning. These allow you to hook up a hose to your deck and spray it clean with ease. Mid-Grade ZTR Mower Buyer's Guide.. Our Power Equipment Direct how-to library can help you learn about How to Fertilize Your Lawn, Vote for Your Favorite Brands in Mower Madness 2019 and Official Mower Madness Contest Rules.